Time and time again the holiday hub of Vail is ranked one of the top ski destinations on the continent, one of the most visited ski resorts in America, and one of the world's premier winter holiday destinations. Claiming the largest single mountain ski area in North America, Vail offers miles of ski terrain and the opportunity to choose a different descent every time. The Austrian-styled village of Vail is a neat concentration of trendy shops, restaurants and nightlife, all within easy reach of the hotels, inns and lodges, and never more than a five-minute walk from the slopes. There is a lift system that provides access to a backcountry experience with trees and peaceful ungroomed terrain. The ski season lasts from November to early May, but the resort remains open for summer holiday activities such as hiking, mountain biking and fishing. 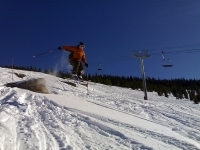 Vail Mountain is a giant that offers three different mountain skiing experiences for different levels of ability, and over 120 named trails. An enormous front face of long, smooth slopes is perfect for cruising, with runs for every level. For intermediates there is a wide variety of groomed runs, the longest of which is almost five miles (8km) long, from Flap Jack to Riva Ridge. The seven world-famous Back Bowls consist of miles of undefined open terrain and panoramic vistas, and are strictly for advanced and expert skiers, excellent on powder days. There are numerous beginners' areas as well as special family skiing areas around the mountains and a ski and snowboard school for learners or those wanting to advance to the next level. The resort reliably receives an average of about 27 feet (8m) of light powder snow each year. With more than 200 shops to choose from, there is plenty to keep shoppers off the slopes on a Vail holiday. Shops range from speciality boutiques to art galleries, from sporting equipment to jewellery, from souvenirs to fine clothing stores. Self-caterers will easily find everything they need. More than 120 Vail restaurants offer everything from award-winning cuisine to local family favourites, from French, Italian, Asian and American fare to fast food, bakeries and delis. One of the top restaurants in the Vail Valley is Sweet Basil, but some would argue that the best dinner can be found on the mountain, at Game Creek Restaurant in Game Creek Bowl. The nightlife and après-ski on a Vail holiday is energetic and vibrant. There are sports bars with big screen televisions and billiards, such as The Tap Room, and a few quality live music venues. Local hotspots include The Bully Ranch, FuBar and a spot on the deck of The Red Lion. Sanctuary is a good late night spot for dancing. Many activities are available for the whole family on holiday in Vail, including horse riding and horse-drawn sleigh rides, dog sledding, ice skating, snow mobiling and snow-shoeing. There is also fly fishing, cross country skiing, telemarking, ballooning and parascending, and the mountaintop activity centre, Adventure Ridge, offers a range of fun activities including downhill tubing. Vail is more expensive than many other holiday resorts, but has a lot to offer visitors for the price. The enormity of the area means that getting between chosen runs takes time and often runs on different parts of the mountain are linked by flat trails, which makes it frustrating for snowboarders.